Erndales N More: THE MAN I CALLED DAD - TALENTS! THE MAN I CALLED DAD - TALENTS! 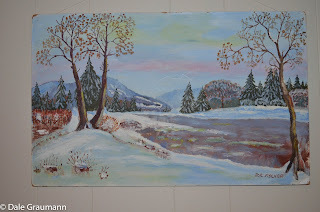 When you are a kid growing up you never stop and think - "Wow, my parent is so talented!" Guess it takes years of living your own life and experiencing what it takes to make a good life for yourself and your family to realize that some people just are blessed with am abundance of talents. Dad was one of these. In an earlier post "Enough Said" I told you about my Dad's ability to use Pig Latin as a language, when he chose to do so. He also was a pretty good musician. 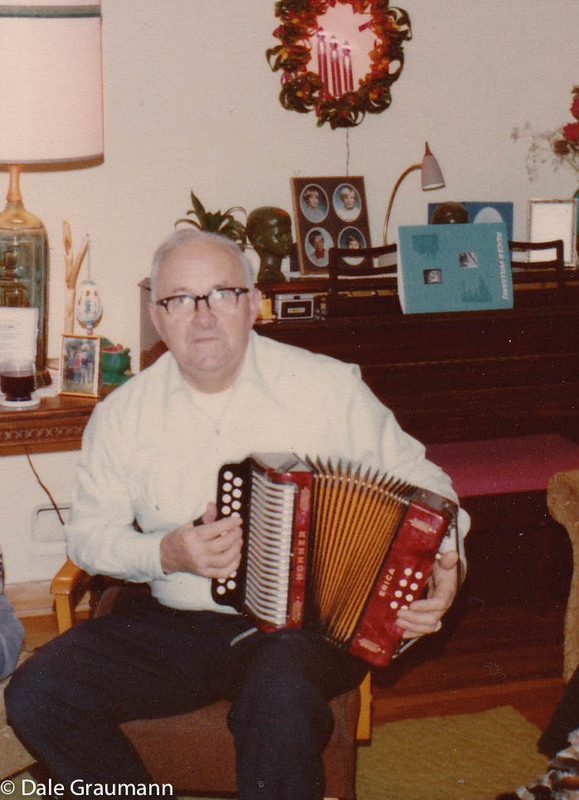 My grandfather played the fiddle, and Dad said that there was always music in his home growing up. 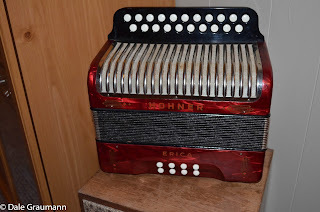 He learned to play the guitar as a young man, and also taught himself to play the "mouth organ" (harmonica) and the Concertina (his "squeeze box")- which is a small accordion-like instrument with buttons instead of keys - which believe me - is not the easiest instrument to play. Each button gives you two notes, depending on which way you squeeze the bellows. Dad loved music and he encouraged all his children to try and learn an instrument. I was like him, I wanted to play everything I saw - and so we had this special bond because of music. Dad was the only one in the house who sat and listened to my practice sessions - always encouraging me to play more. When I had learned all my chords and scales, he brought out his Concertina and we started to practice together - he playing the melody - me chording on the piano. It quickly became "our" thing to do. I learned all his "old songs" - Turkey in the Straw; The Old Washer Woman: You're The Only Star in my Blue Heaven... which he made me learn so he could play and sing it to my Mom. I taught him some new songs... "Dominique" from the Flying Nun... "This Land is Your Land"... and many more. When guests came to visit - we entertained for hours - and when the winter evenings were long - we played - just because we loved to. 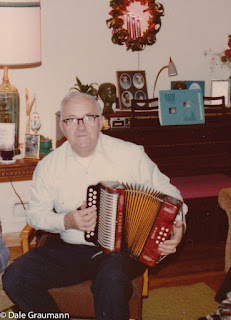 Because of Dad's influence, I learned to play other instruments - his Concertina, my own mouth-organ (given to me as a gift from him); guitar, Melodica, Cello... and these instruments were added to our practice sessions many many times. It is something that to this day, brings me pleasure and pride to think about. It is something I will never forget - this gift that we gave each other. 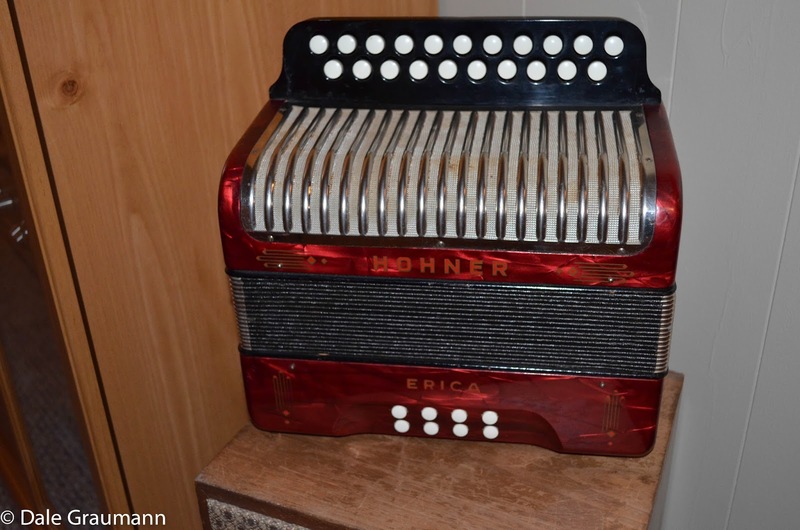 He gave me his Concertina a few years ago - not because I play it well, but I think he knew how much those days of playing music with him always meant to me, and having his instrument would keep it alive in my heart. But Dad had many other talents as well. He could grow anything. His gardens were crazy big and always successful. He could build anything, he could fix anything. He could hand-sew anything and he knew and used the sewing machine almost as well as my Mother. I often felt that if you had handed him a pair of knitting needles, he would have conquered that too. One day he decided he wanted to learn to paint - and so he did. I have a couple of pieces that he painted - not on canvas, but on wood. This little diamond-shape one is my favourite. 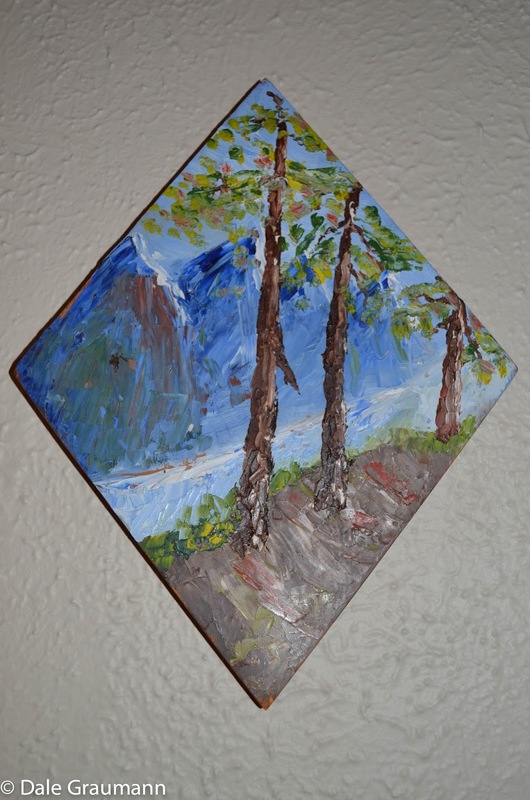 It was one of the first pieces he painted. I wish I had a video of my Dad and I playing our music together - I can hear it in my head - but it would have been so great to be able to hear it again now. But as luck would have it - low and behold it was discovered a year or so go that Dad has a you-tube video of himself playing his mouth-organ. Who knew? I will leave you with him playing "The old Spinning Wheel" - one of his particular favourites and one we played hundreds of times together. HOW DOES ONE PACE ONESELF? THE MAN I CALLED DAD - AND THE CYCLE AGAIN! THE MAN I CALLED DAD - AND THE CYCLE CONTINUES! THE MAN I CALLED DAD - THE CYCLE! THE MAN I CALLED DAD!